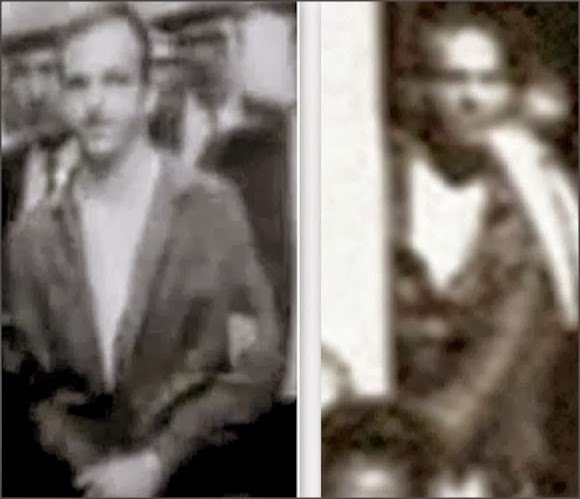 Oswald in the Doorway (not) : the blog of the Oswald Innocence Campaign,debunked by Lance Uppercut: Meanwhile, back in the real world......UPDATED! Meanwhile, back in the real world......UPDATED! Ralph Cinque doesn't like to be challenged. He doesn't like it because it exposes him. This is why the places where Ralph posts are tightly controlled environments where he allows little or no opposing viewpoint to be expressed. We can see here that a high percentage of people see perfectly clearly that doorman is wearing a plaid or patterned shirt, which comes as no great surprise - because he was. 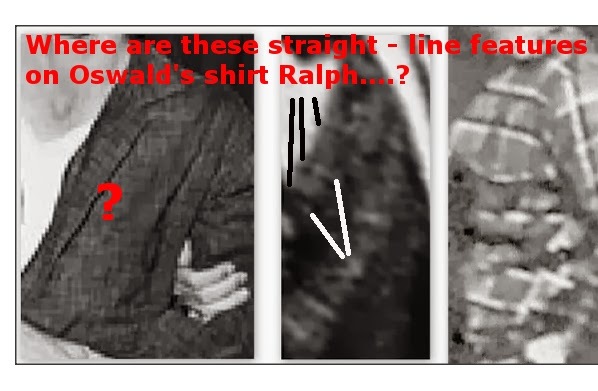 We might not see all of the detail of the pattern but remember we've already seen, using Ralph's own photos, that at this distance in an unfocused shot we shouldn't expect to. ( explored in the original piece here - http://oswaldinthedoorwaynotreally.blogspot.co.uk/2013/09/billy-nolan-loveladys-1273-id-points-of.html ). Fortunately, and refreshingly, the vast majority of people are nowhere near as dumb as Ralph needs them to be. 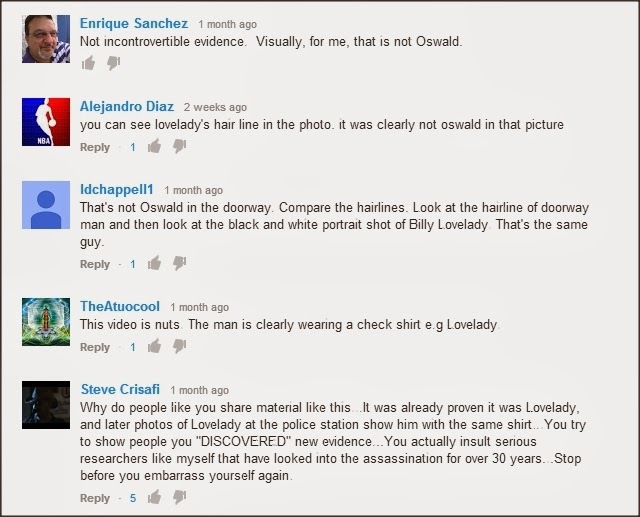 They believe the evidence of their own eyes. The Doorway Man is clearly wearing a patterned shirt. They are indeed double lines as Ralph describes, and some of them are very clearly visible in Altgens 6. This is Ralph's "get out of jail" doorway image, in which the doorway part on the right is an umpteenth generation internet copy of Altgens which in addition has been through the process of offset printing for publication in a book. We can see that it has virtually no detail, but this is of course exactly what Ralph is looking for. 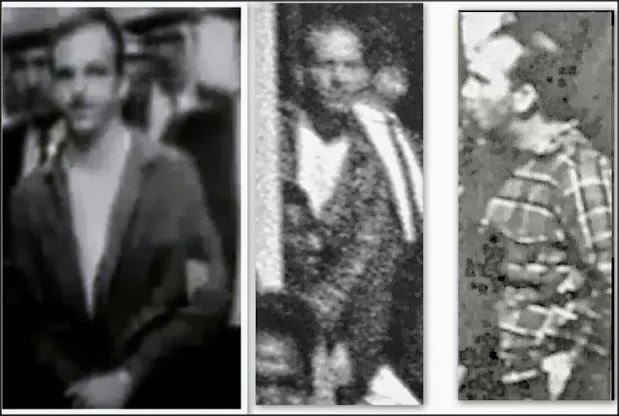 Notice his comments regarding the Groden scan of Altgens, which I have used for my comparisons on this blog. " I have the Groden copy of Altgens, which I believe is the most clear...."
Why then would he choose to use any other copy of the photo when making his points? 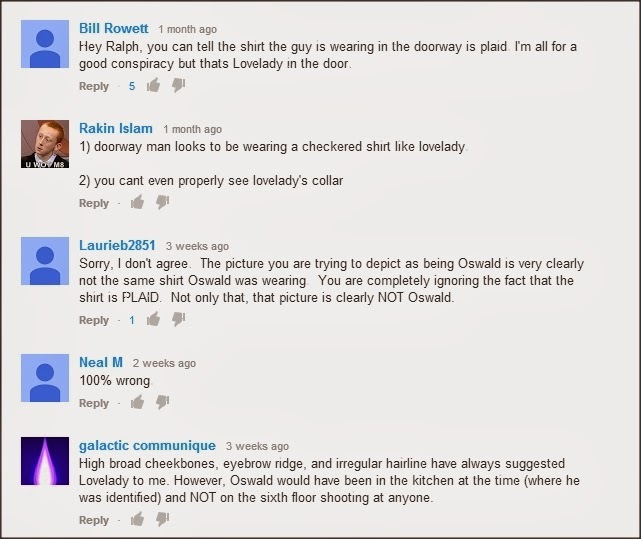 The reason is painfully obvious - clarity is the last thing that Ralph requires when attempting to sell you the lie that Oswald's shirt matches Doorman's. As we've seen, fortunately most people are far too smart to fall for this scam. Of course there will always be some that get taken in. Even the Flat Earth Society still has members, although I'd bet that not many of them would fall for the line of B.S that Ralph is pushing. Ralph is either not all that quick on the uptake or has nowhere left to go with this because he seems to think that just posting a zoomed - in view of the photo that proved him wrong the first time will somehow magically help him out now. It doesn't - but that's OK because it gives me chance to re - ask the question that he dodged the first time. 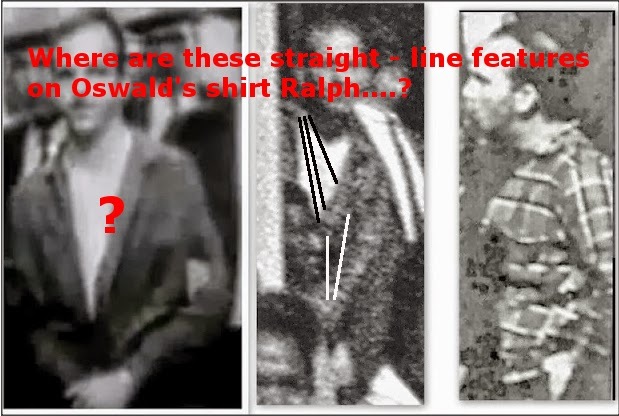 You see Ralph, it really doesn't matter what Harold Weisberg or anybody else thought. 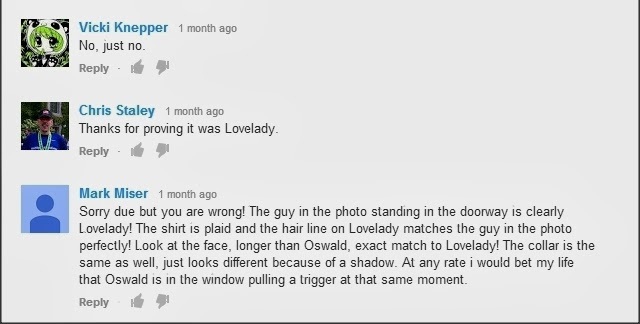 And it's not going to matter until the day that you produce a photo of Oswald in a shirt which matches the clearly visible straight line features on Doormans shirt. And don't forget that they should be the double lines, alternating white over black and black over white which you so eloquently decribed for us on your blog. ( I'm trying to make it easy for you here because I haven't even bothered to mention the visible white vertical line ). What you're actually looking for is a match as good as, say....well, this. You're right about one thing though, the word is certainly out....and the word is that folks can see the glow from your burning underwear all across the world. Happy New Year Lance! All the best in 2014. This was a good one, Lance! Thanks. Ralph's ready to announce his new Fall line of clothing……. The Killer Collection. 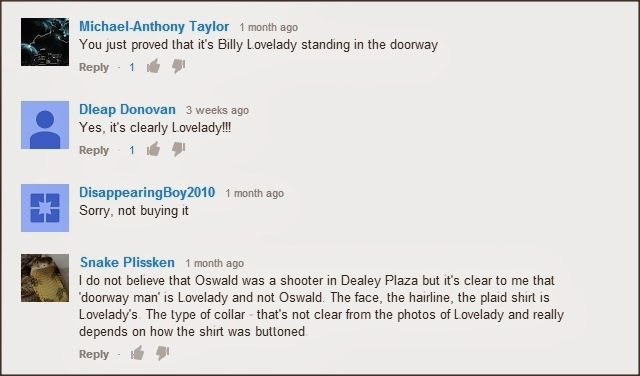 Let's see, there's the 'Bundy blazer', the 'Manson necktie' (made of rope), the Gacy Clown cap, and, of course, the Oswald brownshirts, our most popular item. Get them while supplies (and bloggers) last. Not available in Buda, Texas and Santa Barbara, California. But, but……. "He Didn't Do It" !!!!!! Did he? I honestly don't know for sure. Mind control, blackmail, fame-up or malice aforethought………. take your side, Clyde.